A few weekends ago, my mom, dad, sister and I went out for a Happy Hour at a local restaurant. Even though it was a pasta joint, I wanted a margarita, so I got a “Blue Patron”–a marg with blue curacao and Patron. For some reason, the brighter the color of alcoholic drinks, the BETTER they taste. Neon green, fishbowl blue, hot pink… am I right?! Like when kids want to pick bright red or blue suckers… cocktails, suckers… some things never change. Anywho, I ordered my marg and was a sip in which my mom asked if she could try it. She said she didn’t like margaritas, but that was only because she had the stuff that tastes like Slurpees and I insisted this was far better (um, cause it is). She took one teensy sip and her face puckered into some form of disgust. She continued about how she didn’t like margaritas. I continued drinking mine and realizing more and more I like margaritas A LOT. So I began thinking: with Cinco de Mayo and summer approaching (let’s face it: they’re both excellent excuses to drink), I needed to do something unexpected and different. Something fruity and fun. 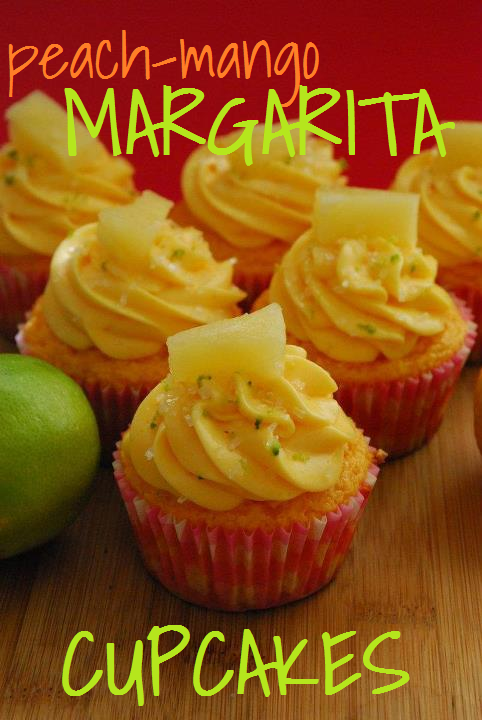 Something margarita… but with a twist. 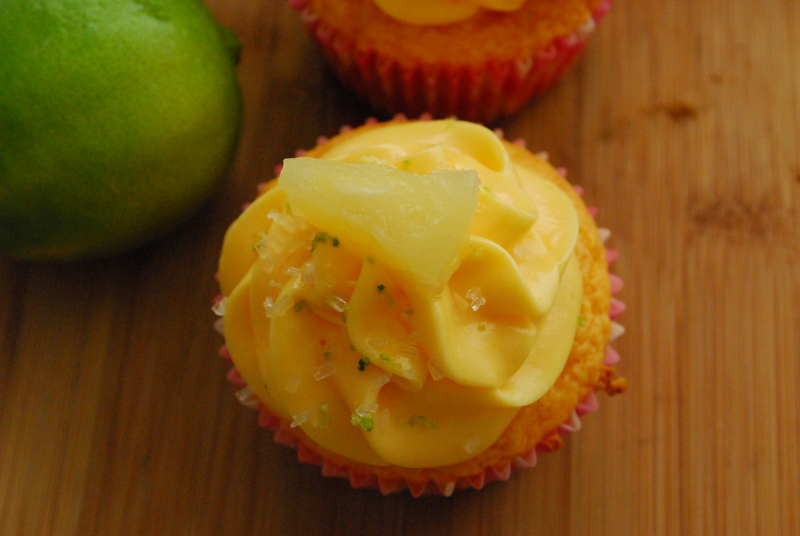 Enter Peach-Mango Margarita Cupcakes. They’re sweet, tart, a wholllllee lotta fruity and super awesome. Technically, there’s no booze in it (I save that for Jacqueline and Ellen) but they are dressed up real cute and have that margarita essence. (Do margaritas have an ‘essence’? Or have I been drinking too many margaritas?) That is the question. 2. In a large bowl, beat together the cake mix, concentrate, oil, egg whites and one packet of the peach-mango Kool-Aid until blended and smooth. Stir in the lime zest and juice until blended. 3. Portion the batter evenly among the muffin cups, about 2/3 full, and bake for approx. 14-16 minutes or until a toothpick inserted near the center comes out clean. Cool completely. 1. In the bowl of a stand mixer, beat together the cream cheese, butter, vanilla and pineapple juice until creamy and smooth, about a minute. Gradually add powdered sugar, about a cup at a time, until frosting is light and fluffy. Beat in the two packets of Kool-Aid until combined. 2. Pipe frosting onto cooled cupcakes. 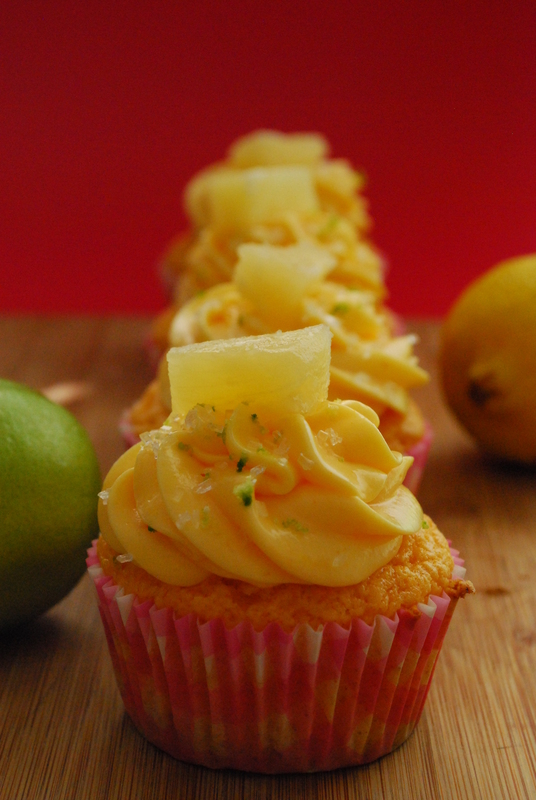 Sprinkle with white sugar (to resemble salt), additional lime zest and garnish with a drained pineapple tidbit. 3. Store any leftovers airtight in the fridge for up to 2 days. Have a great day! I have a HUUUUGE Friday Roundup for you tomorrow! Okay, so YUM. I agree, the brighter the drink the better. But, I hate blue curacao. *Shudder* Margaritas are SO good though. Whaaaaat? I love it! Mixed with things, of course. Otherwise it’s kind of odd on its own. But usually I have it in most mixed drinks so by the end of the night, there could be pool water in there and I wouldn’t notice. I wrote earlier, but I keep getting errors…and my messages evaporate. So, I’ll try again. 🙂 Gorgeous!! And, please, I need a tutorial on better piping skills, mmmkay? Please? Yes? I love this combo, obviously as mango daiquiris seem to be my go-to cocktail at present. Yes! I actually want to do a piping/buttercream tutorial soon so you’re in luck 🙂 thanks Ellen! You make the MOST AWESOME stuff! Seriously, I leave here drooling everyday. There is NOTHING I don’t love about these cupcakes! Can’t wait to see your round-up tomorrow! 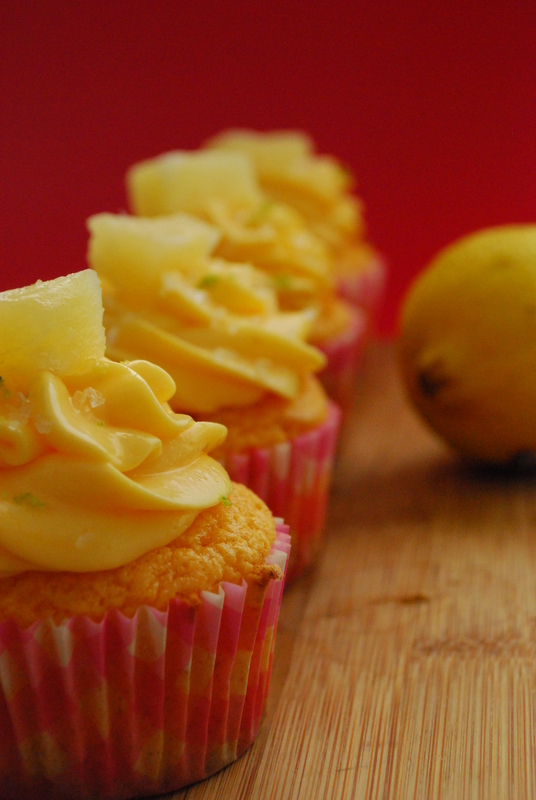 Just found your blog through Pinterest and not only do your cupcakes look yummy, but you make me giggle! Not to sound like a stalker, but I follow you on Pinterest now! Hi Laura! Not stalkerish at all; I’m glad you found me and like what you see 🙂 nice to meet you!